Whether you are celebrating July 4th with friends and family or attending a block party, it is quite likely that alcohol will be present. In some cases, watching other people drink can function as a trigger that causes a recovering alcoholic to lapse back into their former patterns. If you find yourself in this type of situation and do not know how to avoid drinking, never feel afraid to just leave. Removing yourself from the setting for fifteen minutes or the rest of the evening can preclude you from making a big mistake. If you want to be different, you have to BE different (particularly in the earliest days of your sobriety and recovery). Another great way to ensure that you can remain sober during July 4th festivities is by requesting support. Simply sharing your thoughts and feelings regarding the likelihood of a relapse with someone you trust can have a calming effect and help you stay sober. In some cases, you may feel comfortable asking someone to observe your behavior and stop you in the event that you begin to consume alcohol. If you participate in a 12-step program you can check in with your sponsor, before, during, and after the event. 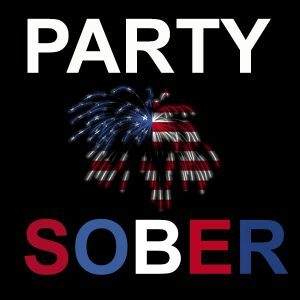 If you are serious about your sobriety and you realize that that July 4th festivities could put you in the perfect place for a relapse, consider the value of participating in sober activities. Ask around to determine whether there will be any sober parties in your local area. You may also want to consider taking the reins and throwing a sober party yourself. If you are a parent or have children in your life (cousins, nieces, nephews), why not make it about them instead of yourself? Spend quality time with your family members. After all, the smiles on the kids’ faces as they play with fireworks can be so rewarding. “I do not feel like drinking” should be the only excuse that you will ever need for not drinking. Unfortunately, it does not always work that way. Our culture has engrained it in peoples’ heads that something is wrong with you if you do not drink. If you do not want to blast it from the mountain tops why you do not want to drink, be prepared! Other excuses include: you are not drinking because you are trying to lose weight, you are not drinking because you made a bet, and you are not drinking for medical reasons. In conclusion, navigating any holiday while sober is a huge point of concern. This is doubly so if you are new to sobriety and have not quite yet figured everything out. With a little planning and preparation, you will be able to celebrate with those you love while staying true to yourself and your goals. Hope you have a safe, happy, and sober 4th of July holiday. If you or a loved one needs help with substance abuse, contact us at 864-227-1001 and let us help you get started on the road to recovery.